Just like the human epidemic, almost 50% of the pet population is overweight. Even a little extra weight can impact the pet's quality of life and relationship with family because that extra weight can reduce play time, impact mobility and affect the lifelong general health of your dog. 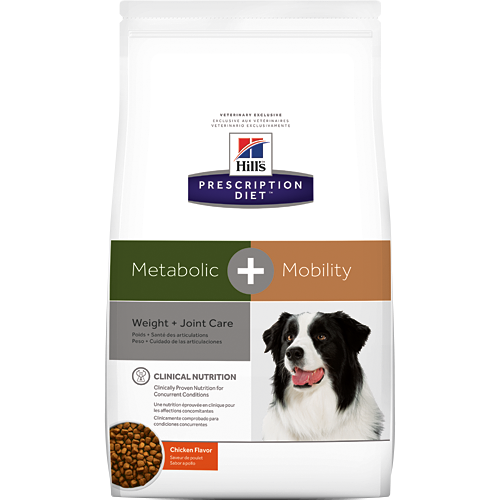 Hill's nutritionists & veterinarians developed Prescription Diet® Metabolic + Mobility Canine clinical nutrition especially formulated to help manage your dog's weight and joint health. In fact, Metabolic + Mobility Canine has clinically proven nutrition to improve mobility in as little as 21 days AND reduce body weight by 13% in 60 days.